today we are heading to a party at our community center where there's supposed to be hot dogs and ice cream i love both of those, so i'm pretty excited! my trainer got hurt so i ended up not riding yesterday... i'm trying to beat these allergies still, and being around all those allergens was killer on Tuesday. i'm soooo ready for them to be gone! 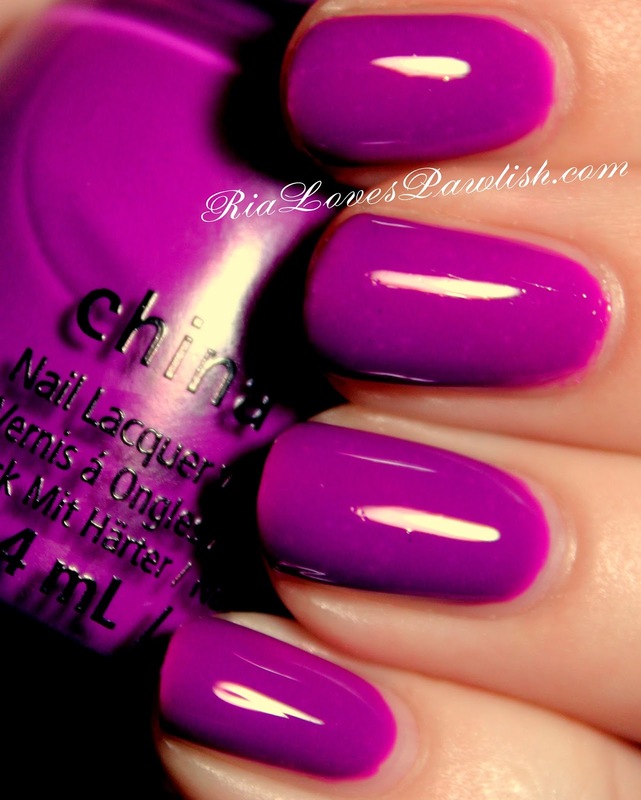 today i have Violet-Vibes from China Glaze Electric Nights to share! (it's a press sample, kindly provided to me for review). it's a warm, plummy purple with a crelly (creme/jelly) finish. it has a more squishy look than a creme, but not squishy enough to be a true jelly! i used two coats for full opacity, you can see that it does tend to look more sheer at the very tips and the base of the nail. it dries shiny on its own, but it's definitely better with a high gloss topcoat. i had so much trouble photographing this one... i tried in several different lights and it always came out way more blue-toned than it is in person. i tried adjusting it with photo software, but it's still not quite an accurate depiction. in person, it's a fun plummy purple that's a bit darker! i think the white circles you can see in the picture are air bubbles from my basecoat, but i'm not entirely sure, they are almost invisible in person. still struggling with getting polish to dry! two coats Violet-Vibes, Salon Perfect Crystal Clear Top Coat. (both are press samples).